A thin slice of history – India, Ink. I was looking for a particular image (which I did not find) on Google Books last week, and I stumbled across this fabulous tome: English Literature: An Illustrated Record in Four Volumes. 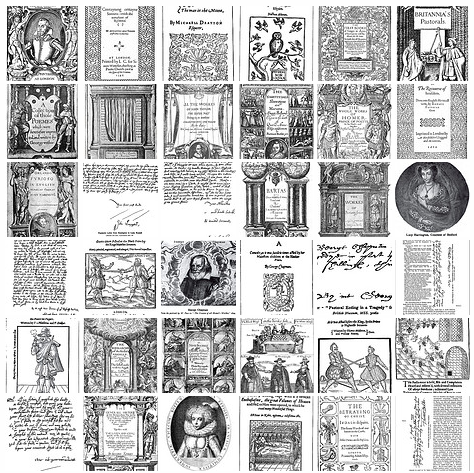 Volume II: From the Age of Henry VIII to the Age of Milton. Part II, by Richard Garnett and Edmund Gosse (New York: The Macmillan Company, 1905). It has illustrations on nearly every page, most of which are title pages from the books under discussion. Some are gorgeous, some are appalling, nearly all are interesting. And they’re all well within the public domain. The problem with Google Books, as I’m sure I’ve complained here before, is that you can’t search for images the way you can use Google Image Search to paw through everything else on the Web. So as a service to the field, I’ve pulled out some of my favorite examples from this book (mostly by taking screenshots from the downloadable PDF), cleaned them up in Photoshop as well as I could, posted them to Flickr, and tagged the hell out of them. I’ve tried to decipher every bit of lettering on most of the images, as well as the captions by Garnett/Gosse, so that it’s all searchable. Anyone who knows Latin will be amused by my misreadings, I’m sure, but I think my renderings of the English bits are pretty accurate. Please feel free to add tags or correct me in the comments. If you think my transcriptions are wrong but you can’t read the text on the JPEG artifact–strewn screenshots I’ve posted, you, too, can download the whole PDF from Google Books and see what you can make of it. Or maybe you could go to Harvard and pore over the original. Perhaps somebody else would like to take on one of the other books from the series? Next Post Books on the why/how of book interior design? YES!!!! I just found your blog while doing a search on Books about Book Interior Design, and was curious to see a blog that said the word Castoff. Oh I feel you on that comment “so you pick the fonts?” or the other one, “so you decide what the running heads and page numbers will look like?” Yup! Thats what i do…in addition to taking that ghastly Times Roman Word doc thats 400+ pages and making fit into 256, because you see its the dardest thing, you have to work in multiples of 16 and 32…aint that a hoot?! I think its very awesome that you have a blog that focus’s around this. I designed book interiors for 8 years in NYC at 3 large publishing houses, and I have so much respect for anyone who does this and think there should be much more notation to us interior folk. The AIGA owes us big time! Your blog is very interesting – and I love these images, what a find.